As an established Permaculture farm we are constantly looking for good varieties of edible and useful plants. We source them from a variety of other nurseries, friends and when we are traveling about. We are always on the lookout for the unusual and hardy productive species we can introduce into our systems. Over the years we have targeted the ones we like for our region, climate and soils. These are the plants that we have chosen to propagate in our nursery and make them available to you. The nursery is important for any permaculture farm to establish. It allows one to grow the number of plants necessary to plant out a larger system and some to sell or trade for other plants or services. In our nursery we propagate new starts from seed, cuttings, layerings, divides and grafting. Always making sure that we have more then one specimen of any given plant ensures that you don’t loose it to deer, frost or other unforeseen events. Below you will find a few of the plant selection that we have on hand ready to plant out in your system. 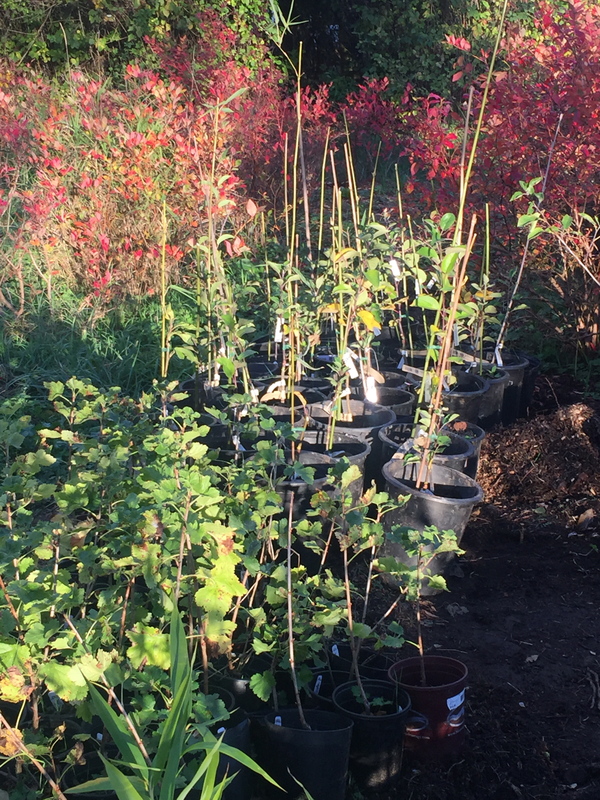 We also have a variety of fruit trees and other seasonal plants. Call us if you are looking for something that is not on this list, we may have it or know where to get it. A productive Easy-to-grow plant that has lots of healthful benefits. Aronia is a “superfruit” that boosts your body’s immune system to combat stress-related diseases. Aronia has extremely high levels of antioxidants and vitamin C, the anthocyanin levels are among the highest recorded. Clusters of. Taller than many bushes, sometimes reaching eight feet. Used as a windbreak or wildlife habitat. This multi-stemmed deciduous shrub has clusters of white flowers in May followed by large violet-black easy to pick berries late summer. The foliage turns an attractive red color in fall. It is self-fertile and a prolific fruiter. Berries are usually made into juice (sweetened with apple juice), teas, jams, wine or syrup. USDA Zones 3-8. A cross of North American coastal gooseberry, European black currant. Thornless spreading shrub producing dark fruits with a mild black currant flavor and firm gooseberry texture. Jostaberry fruit is larger than black currant, but smaller than most gooseberries; has papery blossom remnant on fruit just like gooseberry. Vigorous, productive and disease resistant. Early to leaf out and late to drop leaves that turn sunny yellow in fall, making it a great addition to a mixed hedgerow. Fruits favored by birds. Zone 3-8. An outstanding deciduous shrub that grows 6-8 ft tall with a loose, open form. This shrub has large toothed green to yellow-green leaves 6-8 in. In springtime, tiny lilac flowers appear. By autumn the flowers give rise to berries in striking metallic violet in the fall. The beauty berries are packed tightly together in clusters that encircle the stem. The berries last well into the winter and are an important survival food for birds and other animals, though they will not eat them until other sources are depleted. The berries are highly astringent but are made into wine and jelly. Striking creamy white and green foliage and large clusters of fragrant white flowers distinguish this beautiful, medium- size shrub. This ornamental variety also bears good crops of tasty, bluish- black berries. This bush grows to 8′ tall with an equal spread. Variegation is a cream color against a dark green background. Black fruit is produced in September. Bears a good crops of tasty, bluish-black berries. The egg shaped fruit up to 1 and one half inches in diameter with translucent green skin. The flesh is sweet and mild. It ripens in mid July and is a reliable bearer. Very vigorous and hardy. Hardy to -40° F, drought tolerant, and capable of growing on poor soils and improving them through their nitrogen fixation. Also known as Sea Buckthorn, is a spiny ornamental shrub with large bright orange, edible, tart berries that abundantly cover the branches in the fall. Seaberry fruits are easily harvested and make a good jelly or sauce and a delicious juice. They are an excellent source of vitamin C and have other healing properties, as well as industrial application. Good hedge plants, the gray green leaves of the Seaberry have silvery undersides making them a pleasant addition to any landscape. Medium to large red fruits are very sweet & productive, ripe midsummer. Captivator Gooseberry is a hardy, thornless Canadian variety. Zone 3-9. Jumbo fruits on semi- thornless canes. Foliage turns yellow in the fall. Mildew resistant and very hardy. This hybrid of a European and American species bred in Canada bears large, 1 inch, teardrop-shaped berries on a large, open bush that is both very hardy and mildew resistant. The fruit is green when immature, turning pink to full red when ripe with very sweet flavor. The berries hang in long- stemmed clusters making them easy to pick and ripen in midsummer. Ideal for jellies, jams and juice. Selected from a group of Japanese Honeyberry seedlings at our nursery, Blue MistTM Honeyberry produces abundant crops of very tasty, sweet-tart, large berries. An attractive shrub, it features a spreading form and dark green, soft velvety foliage. Medium sized nitrogen fixing shrub with edible red berries in September. Not related to olive, but having similar looking gray/green leaves. Autumn Olive berries are loaded with the antioxidant, Lycopene, a compound know to protect against cancer. Tomatoes have very high Lycopene levels, but Autumn Olive fruits are 17 times higher. A very hardy, tough, drought resistant shrub. Millions of autumn olive seedlings were planted in the 1930’s on mining reclaimation soils and other poor or erosion prone sites to improve the soil and as wildlife browse. Not surprisingly birds have spread the seeds around such sites that now it’s considered a weed in regions where the fruit isn’t appreciated. Widely adapted to sun or shade. Zone 3-9. Enjoy Nova’s beautiful show of flowers in the spring and harvest abundant, sweet and tasty berries in August! Nova’s almost black berries are good for wine, pies, jelly and cough syrup. Elderberries are one of the most sustainable crops, and is being farmed by many who are interested in nutritious berries. It is packed with Vitamins A, B, and C, iron, potassium, and powerful antioxidants. The plants are a hardy perennial, and are naturally disease resistant. Goumi berries are a rich source of vitamins C, A and E, lycopene and flavinoids, and it is considered to be a medicinal plant in China where it is used to boost immunity and lower cholesterol. The medium-sized shrub grows about 6’ tall and has attractive silver-green foliage. Goumi plants are nitrogen-fixers. They take nitrogen out of the air and improve the fertility in the soil surrounding the plants. Fragrant flowers appear in spring followed in mid-summer by sweet, juicy scarlet-red fruits that have the flavor of tart cherries. Goumi is self-fertile starting to fruit the second year after planting. Zone 3-9. Small Leaved Lime Young leaves – raw. They make an excellent salad or sandwich filling, they are mild tasting and somewhat mucilaginous. The leaves can be available from spring until early autumn from the young growths at the base of the tree. A very acceptable chocolate substitute can be made from a paste of the ground- up flowers and immature fruit. A popular herb tea is made from the flowers, it has a sweet, fragrant pleasant flavor. Some caution is advised, see the notes above on toxicity. Sap – harvested in the spring, it is sweet and can be used as a drink or concentrated into a syrup. Late blooming variety, big sweet fruit with a firm texture and good flavor. From Northern Japan where it is known as Chitose No. 11. Mature height is around 4-5 feet. Blue PagodaTM Honeyberry pollinates with Blue Velvet, Kamchatka, Blue Moon, Blue Sea, or Blue Pacific. Zone 3-8. Native to the Himalayas and China, this evergreen, large shrub features profuse, creamy-yellow flowers followed by bright red, strawberry-like, edible fruit. The attractive fruit is accented by grayish-green foliage that turns a beautiful, reddish purple in the fall. Produces enormous, light red, aromatic fruit with a wonderful flavor. Besides berries that are 25% bigger than Meeker, Tulameen uniquely extends the summer raspberry season through July and August, producing for up to 50 days. Great for backyard growers who can provide well drained soil. USDA Zones 6-9. Larger fruits. Early ripening of juicy, flavorful fruit. Mildew and rust resistant. Cherry Red Currant is very hardy to Zone 3-8. A beautiful 10′ tall, shade tolerant ornamental with showy white spring blossoms. The red fruit is attractive to birds and can be used to make preserves, syrup or wine. The fruit is so abundant and brightly colored that it looks almost like the lights on a Christmas tree. The fall foliage turns a brilliant red. Self-fertile. Full sun or partial shade. A great hedge plant. The Goji berry plant, is considered both a fruit and an herb. A member of the nightshade family, Solanaceae. It is low in calories but high in fiber and contains 500 times more vitamin C than an orange. It also contains high amounts of iron and vitamin A. The antioxidant zeaxanthin gives the Goji berry its red color which contains a high amount of beta carotene that is great for your skin. One quarter cup of dried goji berry fruit contains 90 calories, 4 grams, and 11 of the essential amino acids of protein per serving. Between apples and blueberries in terms of antioxidant power. Goji berries have been used for over 2000 years in traditional Chinese medicine. Large shiny black fruits are very aromatic and are excellent for jam or jelly, yet sweet enough to eat fresh. Crandall has a fruity grape like flavor, very good, but different from European black curranats. Native to the Great Plains. Very hardy & disease resistant. Yellow flowers with clove fragrance are attractive in spring. Good fall color. Zone 2 – 8. This outstanding, everbearing variety features very sweet and flavorful, large, golden-yellow berries, great for fresh eating, preserves and freezing. Fall Gold can be mowed after harvest in the fall and will bear good crops the following summer without staking. Distinguished by its compact, spreading form, attractive grayish-green, velvety foliage and its very large, sweet-tart and flavorful, medium-blue berries. Anna hardy kiwi is one of the most popular hardy kiwis for gardeners and commercial growers alike, Anna’s attractive, very sweet and flavorful fruit can weigh up to 1/2 oz. This easy to grow and reliable vine is the perfect addition to your edible landscape. The buds on this shrubby, twining vine begin as pink, opening to a heavily fragrant creamy yellow. Blooms for the hummingbirds and you from spring through summer. Sun or partial shade. A popular, Aroma type hop, Cascade is known for its high yields and large, elongated flowers. Pioneered in the 1950’s by Jack Horner and his team at Oregon State University, Cascade hops have since gone on to become one of the most popular American hops of all time. Released in 1972, Cascade now represents around 10% of all hops grown in the United States.